Return to the Tomb! Tomb: Cryptmaster is a new game in the Tomb line, fully playable on its own and completely compatible with the original game! Tomb: Cryptmaster brings a stronger focus on the role of the Cryptmaster, with more characters, monsters, and treasures that give you options while the CM, and an all new deck of cards purely for wreaking havoc on other parties! Tomb: Cryptmaster also introduces two other new card types: Curses, which give the CM a whole new way to torture a raiding party far beyond the time of the raid, and Overlords, terrifying beings whose very presence can cause parties to flee in terror! A dungeon delving remake of the classic Hero’s Quest, except you can recruit a raiding party. You start in the Inn where you can recruit adventurers and gather up supplies. There are an abundance of characters to choose from. Some are amazing, some are terrible, most of middle of the road. As mentioned in other reviews, there are some combinations that are crazy powerful, while others are a dud, but it’s how you combine them that will work, a mechanic in most card games. You do have a hand limit and the option to toss back what you don’t want which is key to take advantage of. The tomb cards were pretty interesting, and did hit various aspects of a dungeon crawling game. Items, spells, weapons, crypt cards. They might have been better with one fewer category for simplicity because the spells can be learned or used as a once off. I didn’t mind the extra time though figuring these out. We only played once. One of the players did have a bit of trouble getting started, but quickly used thieving actions to steal what he needed in the dungeon. The overlord segment was fun for us. We enjoyed that part, but I do feel it could have been handled a bit better. Anything that is preset should be disconnected from how people are seated. My only gripe really is that the creature count guarding the tombs themselves where you can pick up treasure is set on the board. This really should have been a random tile that would be placed and card stacks to be resolved later. The game already has a ton of adventurers, why not up the replay with randomness on the creature side. They do ask to you keep track of experience. This absolutely should have been handled with a board, dial, or counter to track. We shouldn’t have to pull out the paper, this does interfere with immersion which given the artwork is really good to begin with. I can’t speak to the rulebook and how it was written, we are lucky enough to have one person who just handles all that along with usually picking up the games themselves. I will say, if you find elements you don’t enjoy, any avid gamer should be tweaking the rules to their taste. I would recommend as a fun game to any dungeon crawler. Just keep a close eye on the characters and cards you pick up, it will make a big difference. Players take on a primary role of tomb raiders, crawling through a labyrinth of crypts and sepulchers to take on monsters, find treasures, and become the most grave robber. It’s a massive dungeon crawling experience that can demand the majority of a night. The game starts off in the Inn where you’ll recruit characters and equipment. This immediately gets into one of the strengths of the game. There are 84 unique characters, all with their own skills, abilities, and art. They’ll come in a few different standard classes. Rogues, Fighters, Clerics and Wizards. Many characters are double and even triple classed characters. At any time, whether starting, the party dies, or you just find yourself in the Inn, you can recruit characters up to a limit. Characters will also draw cards related to their character’s class. They also can gain some basic equipment at the Inn as well. The entire time in the Inn, you’ll mostly be tooling up for adventuring. Combat is heavily relied on with with several dice. Characters come with base stats that will determine what type and quantity of dice you will throw. Treasures, spells, weapons and statuses will heavily manipulate the base statistics as well. Combat is basically done as a skill check where you need so many successes to pass. During the setup, players will be given several “tomb” cards, which will contain monsters, treasures, traps and curses. They will then go in turn order and populate the crypts with these cards, until the crypts are all full. This brings a memory mechanic as you can maybe populate a tomb full of nice treasure while placing nasty traps and monsters in crypts where you think your opponent may be doing the same. When a player reaches a crypt, they may decide to try and raid whatever treasure may be inside of it. A different player, determined by the board, will then grab the cards on that crypt, and play them in a particular order, to try and trip up the opponent. They’ll roll for monsters when they are in combat with them. And finally, they, or other players, may actually play Cryptmaster cards which can influence what happens against the involved players. If you’re looking for balance, look elsewhere. This game feels severely under playtested. Some cards are completely pointless, some characters are outright annoying or weak. And some combinations of characters and equipment is downright godly. The Cryptmaster mechanic just makes a whole new level of “swingy” that stops being fun, and gets to be irritating. Players will want to stop playing cards just to get the game to end. The theme is extremely dark and grotesque. It clearly takes a heavy inspiration from Dungeons & Dragons, but only a more guided board game experience. The game is heavy, and complex, but it is that way for the purpose of supporting the theme. The theme is neither an attraction nor a detriment for me. I can’t say I was interested in it. – Main Board The board is double sided with a smaller, quicker game on one side, and a larger, complex labyrinth on the other side. The overall print quality was decent, but it did have an odd cheap paper feel to it. Fantastic but inconsistent artwork on them. The pieces are extremely thick. But there has to be a huge penalty given for the graphics design of the character pieces. You have the fantastic art work, which gives the thematic personality on one side, and all the stats, skills, name, and biographic information about the person on the other side. The game would have been much better if it were just a large deck of cards with all the information up front with the artwork to show off. The dice comes in D8s of three varieties, essentially a “low chance, medium chance and high chance”. The quality is decent, but the quantity is extremely lacking. You’ll be rolling dice several times. It comes with a good sized back for the characters to randomly be pulled out of. It’s a good size and felt like an average quality. The cards have inconsistent artwork for the rest of the game, but overall the standard size cards are sufficient. Since all the characters and cards have their own special abilities, I’m going to include what is written on them with this part as well. This is, bar none, the worst rulebook I’ve ever had to break through. It is a chore that took several hours and attempts to figure out. Terminology is inconsistent. Definitions are missing. The organization is non existent. 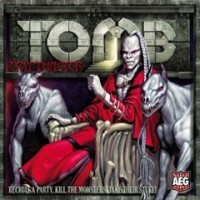 I had to download and read the rulebook to the original Tomb to find some answers on some things. This rulebook almost made the game itself unplayable. Every time someone would draw a new card, we’d have to try and reference something in the rulebook to try and understand the timing. It isn’t because it is complex. I’ve played many games that are far more complex. It is a broken, almost useless rulebook. It uses lots of words to teach and inform very little. This may have been the biggest reason why I purchased this game. I wanted a big monster of a game, and this looked to be it. The art was dark. The creatures were unique. It had a good gothic vibe from it. The vast number of characters would almost make it worth it. The equipment, spells and skill card variety seem a bit lackluster. A single game eventually starts to feel very “samey” by the end of it, and all my other plays always had people wanting the same items. I can’t shake the feeling that this game is a hair away from meeting the definition of “broken during design”. It’s a game that drags on and gets extremely repetitive. If it took 60-90 minutes, it would be more forgiving, but you’ll be lucky to be a third of the way done by then. This is a game that has a good spirit about it, but mechanically it is incredibly flawed. I couldn’t recommend this to any group. There are several other games I’d recommend before suggesting people try this one. I only recently picked up this game. My only regret is not picking it up when it was in production. This is one of the best dungeon crawls I have ever played. The game play is complex enough to hold interest, but not be bogged down with fiddly rules or pieces. The artwork is beautiful and is re-used from AEG’s Warlord: Saga of the Storm CCG (also a magnificent game). The rule book is typical of games of this type. At times it is a little jumbled. But, it is not difficult by any sense. This game is now (2016) out of production, but copies can still be found. I strongly recommend this game to anyone who is a fan of the dungeon crawl. Add a Review for "Tomb: Cryptmaster"